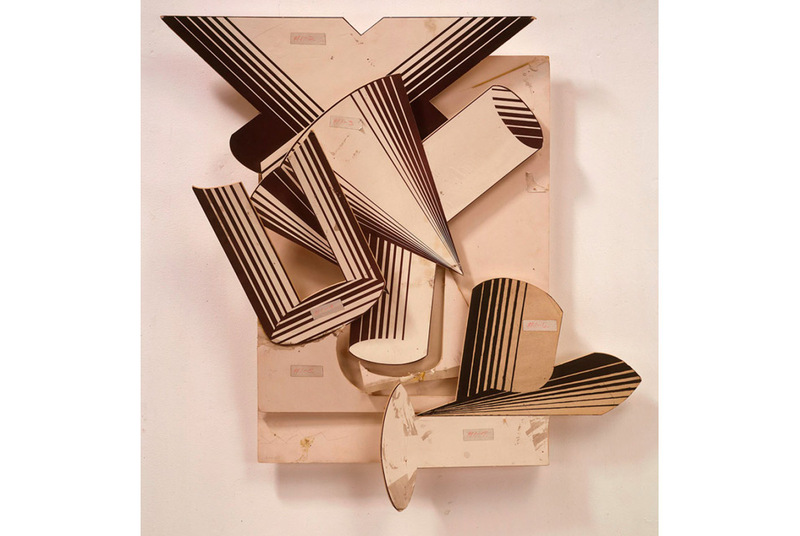 Frank Stella (American, 1936), Maquette for Lo sciocco senza paura [Fearless Simpleton], 1983. Ink on foamcore, 33 ½ x 33 ¼ x 5 ¼. NEW YORK, NY.- FreedmanArt presents the exhibition Painterly Pasted Pictures opening February 21, 2013. This show features collages on loan from important private collections, with a concentration on works by the artists of the Abstract Expressionist generation as well as several artists of the broader successive movements. The exhibition will feature important collages by Willem deKooning, Helen Frankenthaler, Ellsworth Kelly, Franz Kline, Al Leslie, Robert Motherwell, Ann Ryan, Kurt Schwitters, Frank Stella, Jack Youngerman, Robert Rauchenberg, as well as works by other artists. Painterly Pasted Pictures focuses on a broad and major change in the collage medium beginning in the later 1940s. Earlier collages, starting with the very first cubist compositions of a century ago, had mostly used paper shapes cut into forms with crisp profiles, perhaps most familiarly defined by the color elements found in Henri Matisses decoupages of the late 1940s. To be sure, some key exceptions took place earlier, including the richly textured collages made in the 1920s by Kurt Schwitters, and those made with torn, or even crumpled, paper introduced in the 1930s by Jean Arp. Beginning in the later 1940s in New York, the Abstract Expressionists paintingsand those of other contemporaneous artistsbecame more loosely constructed with bold brushstrokes in fluid gestures. So too, echoing this stylistic change, their new collages began to employ papers (and sometimes other materials), often in complex, counterpointed layers assembled of papers with torn or ragged edges. Other collages of this time used crisply cut shapes set into contrasting painted gestures, or melded torn papers and gestural abstractions in other media. Finally, a few works set painterly elements within contrasting situations. Mr. Carmean organized the previous exhibition Pasted Pictures: Collage and Abstraction In the Twentieth Century at Knoedler & Company in 2000. Painterly Pasted Pictures is a successor show to that presentation and will be one of the first exhibitions to focus on this distinctive feature of modern collages.